Note that, in the above rule, :first-child is a pseudo-class that identifies if <p> is the first child of its parent. As far Telugu is concerned, web browsers are not identifying the first letter correctly. (A Telugu character can go up to 7 Unicode code points or even more. E.g., “స్ట్రాం” in స్ట్రాంగ్ has 7 code points.) I had filed a bug pointing this issue in Firefox. Now the bug got fixed, Firefox identifies first letter correctly. 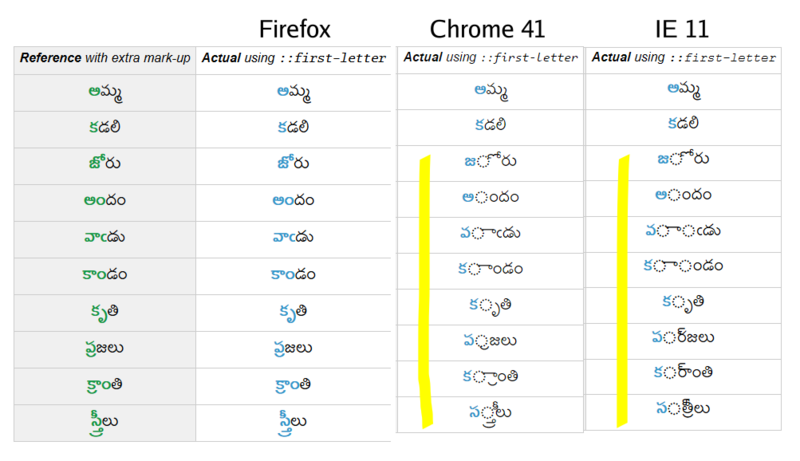 To see if the browser version you are using supports Telugu first-letter, use this page (or this). And, report issues to the makers of your favorite web browser. There is a Telugu version of this post.